The school holidays are all but over. We've had some awesome weather here in Dunedin, but a cold snap is forecast for Sunday. There is even a mention of snow! As Hubby is a teacher the whole family have been on holiday. We've had trips to town, take away teas, and watched some good family movies. 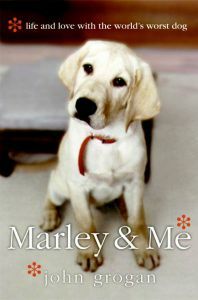 Marley and Me had us all in tears, while Pink Panther 2 had us hooting with laughter. We also checked out The Golden Compass, which had my youngest wanting to read the books. Hubby and I managed a couple of 'dates' without the kids and the odd sleep-in. He's back to work today with a First Aid course and I'm dealing to a pile of washing. Funny how the uniforms only made it to the laundry last night! I've totally ignored the writing for a couple of days and put the muse on holiday. The short story I blogged about earlier is complete, but I'm leaving it to marinate before I do the final edit. I think I'm overdue for recharging the batteries and blowing away the cobwebs. This isn't the same pattern, but it's similar. Tomorrow I plan to lose myself in the sewing room. Something I haven't done for a while. I hope I remember where to find it! A friend lent me a pattern for a wall hanging that I want to make a start on. 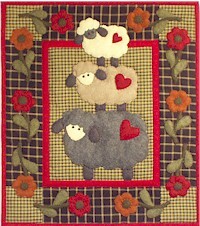 It's an applique of three sheep stacked on each other's backs. Mmmm, I know that sounds odd, but it does look nice - cute and country. I'll post a photo when I get it finished. Glad to hear you enjoyed your holiday break, and leaving the laundry till last made me laugh. That applique is very cute! I used to quilt wall hangings but lost interest a while ago, although I did write up a post with a photo of my best piece not long ago. I haven't stuck it on my blog yet, a bit of a chicken you see. Enjoy your time away from the novel. A Certain Book - would love to see your wall-hanging. Go on, be brave.